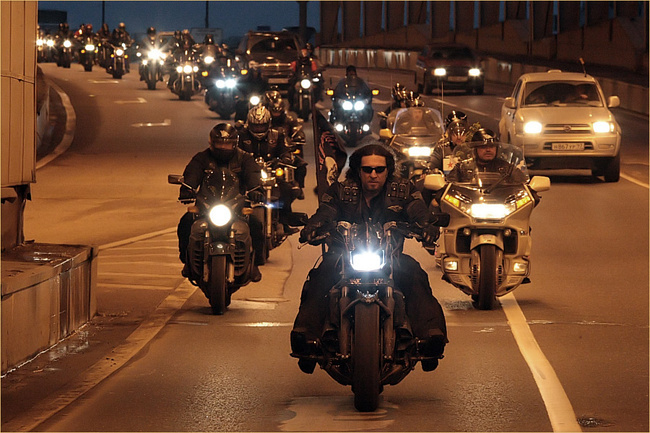 Home Culture and sport “Night Wolves Sofia” Motorcycle Club Starts It’s Victory Ride, Traveling The Same Path Liberated By The Great Soviet Red Army During The Second World War ! “Night Wolves Sofia” Motorcycle Club Starts It’s Victory Ride, Traveling The Same Path Liberated By The Great Soviet Red Army During The Second World War ! A Russian yearly tradition begins of the Night Wolves Motorcycle Club begining their Victory Ride across the areas liberated by Soviet Russian military forces during the Second World War. Members of the “Night Wolves-Sofia” motor club will travel over 5 thousand km from Sofia to Belgrade-Budapest-Bratislava-Brno-Prague-Decin-Dresden-Torgau-Seelow-Berlin between May 1 and 9. The route of the motocross repeats the path that the First Bulgarian Army moved in the Third Ukrainian Front to Austria, and contributed to the liberation of the fraternal peoples of Macedonia, Serbia, and Hungary. Throughout the route, the participants will visit the memorial complexes of the Great Patriotic War. The final part of the race will take place on May 9 in Berlin. A motorcade with the Victory flags will pass through the city, paying tribute to the memory and respect of the deceased and veterans of the Great Patriotic War. In Treptow Park motorcyclists will lay flowers at the foot of the monument to Warrior Liberator. Bulgarian and Russian patriots, members of public organizations and political parties gathered to conduct the motocross. The head of the club “Night Wolves – Sofia” Dencho Zlatanov told the audience about the idea and concept of the motocross. On behalf of the Russian veterans living in Bulgaria, Alla Ilieva, survived the siege of Leningrad, expressed her sincere gratitude to the members of the motor club for the memory and respect for our common Victory. Greeting words and wishes of a good journey to the participants of the motocross were also given by the chairman of the Coordination Council of Russian Compatriots Marina Dadikozyan, the head of the Rossotrudnichestvo in the Republic of Bulgaria Pavel Zhuravlev, the chairman of the Russian Club of Sofia Sofi Nonna Dikova and the representative of the youth organization MO’DIO Alexander Aleksandrov. Before the start of the column, those present performed a mobilization of travelers. A concert was held for the participants of the motocross race – the songs of the war years were performed by Greta Gancheva, Vladimir Marinov, Nikolai Shevchenko, Petr Petkanov and the children’s vocal studio “Domizolka”. just a bunch of fruit loops on western bikes .